Without people who dream big, our cities would have no skyscrapers, our skies no airplanes, and no one would have been delighted by Tom Hanks dancing on a giant piano with Robert Loggia. 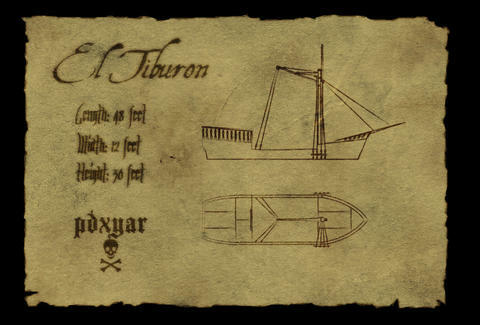 To help some swashbuckling dreamers get on deck, get involved with PDXYar's noble quest to construct El Tiburon. A Kickstarter campaign with the goal of raising funds to create a life-sized/basically functional pirate ship, the Tiburon crusade began when the corseted, cutlassed, rum-soaked crew behind Portland's professional pirate cosplayers realized they couldn't reach their full potential without a vessel, something that separates the real privateers from those who just don an eye-patch and play in the yarrrrd. The proposed ship, El Tiburon, will be a 48-footer with 30' masts boasting working sails and rigging above a large stage-like deck to showcase sword fighting and cannon fire, and also rock "all the accoutrement one would expect on a working pirate ship from the 1700s", though to allow it to be transported to landlocked events, it won't have a keel or hull, although Brett's kinda a prick anyway, so that's not a huge deal. In classic pledge-drive spirit, PDXYar's offering sweet booty to donors, ranging from a crew-signed photo of the completed vessel, to a bag of liar's dice in a handmade leather pouch, to a full set of glassware etched with their logo, to two passes to the Portland Pirate Fest and a private photo shoot with the crew while getting down and dirty on the ship as they "drink to your glory", which dudes in the movie would be alarmed by, assuming an amputation was to follow. While PDXYar's just hoping to hit their goal within the month, they also have contingency plans should more doubloons than "needed" roll in, including among other things hosting combat workshops and buying weapons, also how Loggia got Big in Miami before Montoya came along.